Visitors to the Adirondacks can’t help but spot New York’s second-largest land mammal, the black bear, around virtually every turn. Admittedly, most of those bear sightings occur in gift shops and antique stores. The fuzzy or wood-carved likenesses are often portrayed paddling canoes, swinging tennis racquets or squatting on their haunches with a fishing pole in hand. A small percentage of Adirondack Park visitors are lucky — or unlucky — enough to see a real bear in the wild. The region is home to New York’s largest bear population, an estimated 5000 black bears, with adult females ranging in size from 150 to 250 pounds, and adult males from 200 to 600 pounds. Confrontations between bears and humans are likely to be of the unwanted variety, especially in the backcountry, when hikers and campers fail to secure their food and other odorous items (toothpaste, soap, insect repellent) out of the animals’ reach. Gone are the days when backpackers could simply find a tall tree limb from which to hang a food bag overnight. Black bears are curious, intelligent and highly resourceful, and these denizens of the Adirondacks figured out long ago that tasty morsels can be had in those nylon stuff sacks dangling from ropes. For this reason, New York passed a law in 2005 requiring all overnight campers in the region to use bear-resistant canisters between April 1 and November 30. But even that method hasn’t been foolproof. Since 2007, state wildlife biologists and frequent visitors to the eastern High Peaks have learned of at least one ingenious bear who has figured out how to open the BearVault, a popular and allegedly bear-resistant food canister. The adult female, nicknamed “Yellow-Yellow” for the yellow wildlife-tracking tags she wears in each ear, has gained notoriety for her digital prowess. 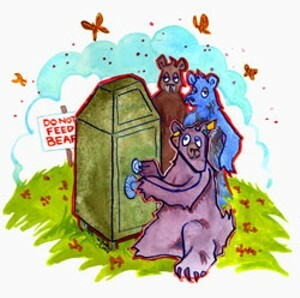 The relatively small (125-pound), shy creature has become so adept at opening BearVaults that, in 2008, the device’s manufacturer redesigned the lid. But Yellow-Yellow soon figured out the new container’s complex locking mechanism. As a result, the BearVault website now includes a disclaimer warning consumers not to use the product in the Lake Colden/Marcy Dam region. The notice insists, however, that the problem is unique to the Adirondacks and hasn’t occurred anywhere else in North America. What has enabled at least one Ursus americanus in the Adirondacks to outsmart food containers that have foiled much larger and more powerful bears, including Rocky Mountain grizzlies? Smaller digits? Bigger appetite? Genetically superior intelligence fueled by pilfered protein bars and discarded copies of the New York Times? None of the above, according to Ed Reed, a wildlife biologist with the New York State Department of Environmental Conservation. Reed is a 26-year state wildlife veteran who has captured and handled Yellow-Yellow on three occasions and observed her behavior in the wild. He says her achievement is more likely a case of the devil making work for idle hands. Also, Reed doesn’t believe Yellow-Yellow is the sole culprit in all the break-ins reported by campers. Is Yellow-Yellow leading an entire gang of rogue bears who fiddle with each new canister design, as if it were a Rubik’s cube, until they unlock its secret? Maybe she’s even lured her cubs into a life of crime? Improbable, Reed says. Yes, Yellow-Yellow is nearly 20 years old — four years ago, wildlife biologists determined her age by extracting one of her teeth and counting its rings, like a tree stump — and she’s known to have raised several litters. However, Reed points out that most cubs leave their mother before their second winter, either to scope out their own territory or because she chases them off so she can breed again. In short, Yellow-Yellow’s offspring may have seen their mama bear crack open a can or two, but Reed doubts it’s happened often enough for them to learn the trick themselves. If it seems as though wildlife biologists know a lot about Yellow-Yellow and other Adirondack bears, there’s good reason for that. 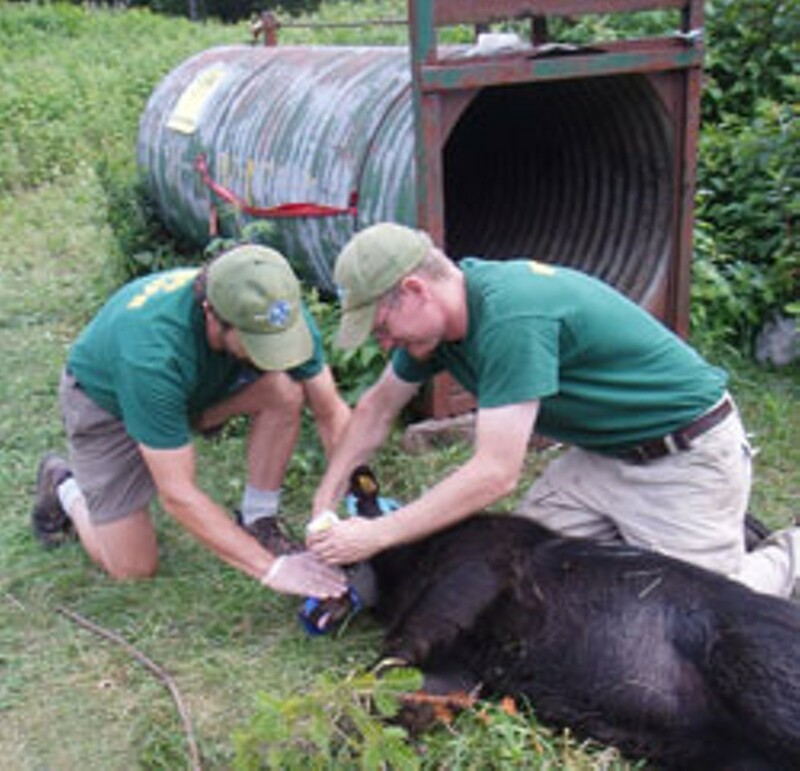 In 2004, the DEC launched a comprehensive two-year study of the black bears of the eastern High Peaks, which included outfitting them with radio and GPS collars. The study was designed to help state wildlife managers get more accurate estimates of bears’ numbers, ages, sexes, sizes and home ranges. Why do wildlife managers need to know, for example, that one adult male would travel from the High Peaks to Keeseville — about 45 miles as the crow flies — just to snack on a good crop of acorns? One practical reason is to determine the odds of trapping and successfully relocating a “nuisance” bear. Under DEC protocol, a home invasion is considered a “class 1” offense for a bear, meaning that if it’s caught, it must be destroyed. Lesser offenses, such as occasional raids on trash cans or campground Dumpsters, are more likely to result in a bear earning a one-way trip out of town. However, Reed admits the DEC has had poor luck in relocating bears; one traveled 70 miles to return to its point of origin. The most effective bear relocations tend to involve young males, before they’ve become established in a territory. One- and 2-year-olds haven’t been to enough places to know where they are, Reed says, whereas older, more worldly bears are more likely to find their way home. Right now, Reed and other DEC big-game managers are entering their busy season. August is the most active month for Adirondack bear sightings, when many descend from higher elevations where the greens have all dried up or been grazed out, but before the fall’s berry crops appear. August is also a high-use time for backpackers in the High Peaks and hence the most common juncture for bear-human encounters. How common are bear attacks in New York? Unlike in the western United States and Canada, they’re exceedingly rare. Reed tells of one woman who got scratched by a bear about six years ago when it reached around her lean-to to grab her backpack at the same time she did. Occasionally, sows will “bluff charge” a human when they’re startled, he adds, but full-blown attacks are virtually unheard of. There’s only one record of a person being killed by a black bear in New York — a baby in the Catskills, who was mauled more than a decade ago. Nevertheless, bear-human encounters are bound to become more common, especially as New York’s black bear population and habitat grow. In fact, this year the DEC is opening up new regions to bear hunting along the New York’s border with Vermont and Massachusetts, owing to the bears’ thriving numbers. These days, Reed also has his hands full trying to solve nuisance problems — bears raiding garbage cans, bird feeders, dog-food bowls left on patio decks and other easy pickings. In some years, nuisance bears create a full-time job for two staffers, though it’s been quieter since last spring’s higher-than-normal rainfall fostered an abundant food supply in the backcountry. He emphasizes, though, that while it’s tempting to ascribe human ingenuity to Yellow-Yellow and her cohorts, the term “nuisance bear” is a misnomer.